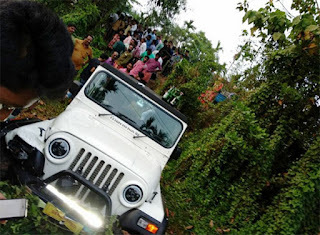 A Jeep in which cine actor Mamukkoya and friends were travelling met with an accident at Thondayad Bypass Road on Tuesday night 8 pm. As per reports, two persons were seriously injured in the accident the jeep in which cine actor Mamukkoya and friends were travelling hit them.The two injured were identified as Prashant and Jomol by the police at Medical College casualty. According to the offcials, they were on their motorcycle and had suffered multiple fractures and other serious injuries.The actor and friends suffer no injuries. There are unconfirmed reports the actor and his friends were drunk. Kozhikode City Traffic Circle Inspector T P Sreejith confirmed Mamukkoya was in the Jeep. However, he said it is yet to be confirmed whether the gang was drunk or not. Veteran Actor Shammi Kapoor is no more.